Recently, Google announced that Google AdWords will become “Google Ads” starting on July 24, 2018. We thought this would be a good opportunity to discuss what it is, the advantages to using it and how to get a campaign underway for your business. Google AdWords, one of the most effective online advertising options available, empowers marketers to create online ads to reach people searching for the product or service you offer. AdWords allows businesses and website owners to bid on the chance to show their ads above other search results on Google. 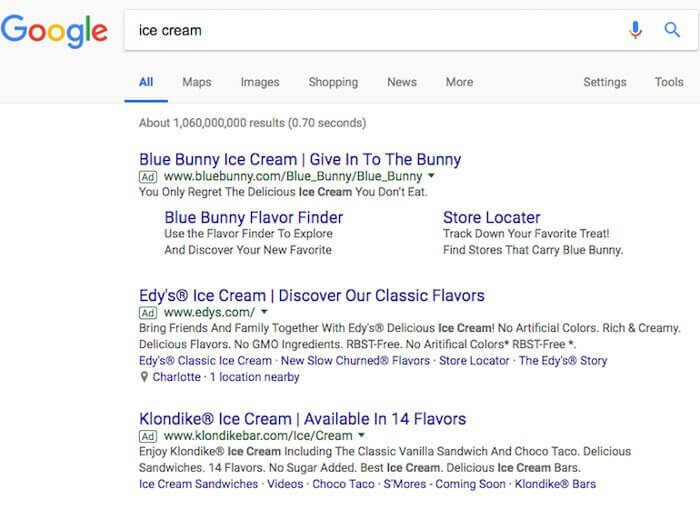 For example, a search for ice cream returns three paid Google AdWords ads, posted at the top of the search results page, above the organic (unpaid) search results. It’s a quick process and can gain immediate results for your business. It’s affordable. You can start as small as you’d like to test the waters. It’s highly measurable. You can track what works and what doesn’t. Click Through Rates far exceed any other local online advertising we’ve found. Google AdWords also leads to high conversion rates on your website as compared to any other paid platform. You are showing your ad to people who are currently searching for the product or service you offer. From a marketing perspective, there is no better way to reach qualified leads. And the best part? You only pay when someone clicks on your ad to visit your site or to call your business, so you’re not wasting money on vague “impressions” or “reach” with no results. What are the goals you want to achieve? Calls? Appointments? Visits to your website? What is the product or service you want to promote? What is your messaging and what are the keywords or topic groupings that a user would search? Where you want to be seen? You will want coordinate the keywords you choose and the associated landing page content to optimize the experience for visitors. How do you configure the structure of the URL and landing page for best possible search results and user experience? What is your customer’s geography? Is there a particular age group you want to target? Is there a household income range that makes sense for you? Do you want your ads to be shown only on mobile devices only, all devices or some combination? Is there an optimal time of day or day of the week? Once these questions have been answered, it’s time to develop your text ads. For best results, create compelling messages, a clear call-to-action and a strong, coordinating landing page on your website. These ads are linked to, or associated with, a list of relevant keywords and your ads are shown when a search is performed using any of those terms. There are many more details and nuances to Google AdWords, but we hope we’ve conveyed the importance of executing a well-thought-out campaign. Our team at Belgrave can help you in a variety of ways, from strategizing all the way to fully implementing and providing analytics. Please let us know if you’d like help.